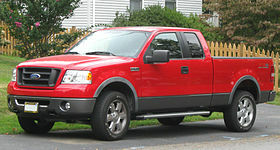 In 2004, Ford redesigned the F-150 using the new P2 platform. The side windows also changed to a Kenworth "Daylight Door" and Ford Super Duty-like appearance; dipping towards the front of the door. Initially, only Ford's 4.6 L Triton or new 3-valve 5.4 L 3V Triton V8 engines and four-speed automatic transmissions were offered to the retail public on the new trucks. In 2005, Ford's 4.2 L Essex V6 and manual transmission became available and standard on base models after they were available only for fleet orders for 2004. The F-250 and F-350 Ford Super Duties (on the P3 platform) are a different class (over 8,500 lb (3,900 kg) GVWR) than the regular F-series lineup, although they are still F-series trucks. Most F-Series have two large "closed loop" front tow hook design (no hooks on some 2wd models) as opposed to conventional open hooks. The F-Series can pull up to 30,000 lb (14,000 kg) with just one hook. For the 2006 model year beginning in December, 2005, a flex-fuel version of the 3-valve 5.4 L Triton V8 became available. Also for the 2006 model year, an updated front bumper with circular fog lamps and a smaller bumper vent distinguished the 2006-2008 models from the 2004-2005 F-150. Other updates included improved front seats with more supportive side bolstering, and new 20" wheels were available on FX4, Lariat and King Ranch. A navigation system became an option for the first time, being offered on the Lariat and King Ranch, as well as the all-new Harley Davidson trim. Not leaving the XLT unnoticed, Ford offered an XLT Chrome Package, also known as XTR in Canada, as well as a Lariat Chrome package. SIRIUS satellite radio became available on all trims except the XL. The FX4 became more upscale with a Luxury package, making it almost an alternative trim to the Lariat. A Harley-Davidson special edition was offered for 2006, being available in AWD or 2WD, and only in SuperCab. for 2007, a SuperCrew Harley Davidson was offered. Other mid-cycle refresh improvements included Five inch Running boards, traction assist on 2WD V8 models, and an all new "Smokestone Clearcoat Metallic" paint on Lariat only. For 2007, Ford introduced a complement to the existing FX4 model, the new FX2 Sport package (a 2-wheel-drive truck with an appearance package). Ford states a properly equipped 2007 F-150 (Long Wheel Base, 2WD model only) can tow up to 11,000 lb (5,000 kg) maximum and 1800–3050 lb maximum payload. This generation F-150 got top safety ratings (5 stars) from the U.S. National Highway Traffic Safety Administration (NHTSA) in frontal collisions, and not only got a "Good" rating from the Insurance Institute for Highway Safety's frontal offset test, but also a Best Pick. The dummy sensors recorded no injuries to any body region. Saleen offers their own OEM version of the F-150, badged as the S331. Additionally, Roush offers an aftermarket version with similar power. Beginning with the second half of the 2007 model year, Ford offered the Saleen forced-induction package on the Harley edition as an OEM option. The F-150 Foose Edition debuted in fall 2007 as a 2008 model. Based on an F-150 FX2 Sport, it uses a Roush-developed powertrain. The supercharged 5.4 L V8 puts out 450 hp (340 kW) and 500 lb·ft (680 N·m) of torque. The new F-150 earned the North American Truck of the Year award for 2004 and was Motor Trendmagazine's Truck of the Year for 2004. It also beat the three-time winning Chevrolet Silverado for Car and Driver magazine's Best Pickup Truck for 2004 and 2005. The Ford F-Series has also earned the 2012 Motor Trend Truck of the Year. Additionally, over 939,000 F-Series trucks were sold in 2005, a single-year sales record for trucks. As a popular fleet vehicle, this generation of the F-Series has garnered a number of awards from fleet management professionals. The 2006 F-150 was named Fleet Truck of the Year by Automotive Fleet and Business Fleet magazines, and the 2007 models of the F-150, F-250 and F-350 were chosen Best Fleet Value vehicles in their respective categories by automotive data-analysis firm Vincentric. Winner of the 2006–2007 Golden Icon Award (presented by Travolta Family Entertainment) for "Best Truck".